In general, all clinically effective antiepileptic drugs are effective against audiogenic seizures in mice and rats. Phenytoin, phenobarbital, valproate, ethosuximide, tri-methadione, diazepam, clonazepam, and lorazepam have all been reported to protect against audiogenic seizures in DBA/2 mice.65 Broad spectrum anticonvulsant effects have also been reported in Frings21 and Rb mice.66 Carbamazepine, phenytoin, valproate, ethosuximide, phenobarbital, and clonazepam have been demonstrated to produce anticonvulsant effects in both GEPR-3s and GEPR-9s.412 Such broad spectrum anticonvulsant responsiveness led Chapman and coworkers65 to conclude that protection against audiogenic seizures (in mice) is a sensitive screen for anticonvul-sant effects, but lacks the ability to determine clinical efficacy against specific seizure disorders. Techniques are described below for data analysis in the GEPR that do offer prediction of clinical efficacy that could be applied to audiogenic seizure susceptible mice. The consistent audiogenic seizure responsiveness of the GEPR makes it ideally suited for the evaluation of anticonvulsant drug effects. GEPRs that have undergone the audiogenic screening procedure described above can be utilized for anticonvul-sant experiments.412 To be eligible for anticonvulsant experiments, GEPR-3s must exhibit a seizure rated at an ARS of 3 on each of the three weekly screens.4 Eligible GEPR-9s must exhibit an ARS of 5, 7, or 9 on the first weekly screen and an ARS of 9 on the last two weekly screens. All GEPR-3s and GEPR-9s exhibiting this seizure history can be expected to exhibit an ARS of 3 and 9, respectively, on subsequent audiogenic screens.4 Any reduction of seizure severity is considered to be due to the drug being tested in the GEPR. Anticonvulsant testing occurs 1 week after the third audiogenic screen. In the majority of GEPR anticonvulsant studies, an anticonvulsant effect is defined as any reduction of seizure severity or ARS score.12 Any seizure rated below an ARS of 3 in a GEPR-3 or below an ARS of 9 in a GEPR-9 would be considered an anticon-vulsant effect. The anticonvulsant response utilized under this procedure is in effect a minimally detectable anticonvulsant response. The effective dose fifty (ED50) is calculated for this minimally detectable response according to the method of Litch-field and Wilcoxon.67 The advantage of such a technique is that it minimizes the number of animals required to generate an ED50 for a particular drug. 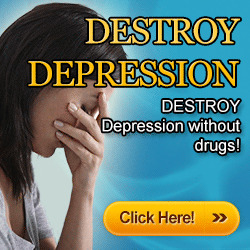 It is a quick, simple, and easy screen for general anticonvulsant efficacy. The disadvantage of such a technique is that no information is generated about the effect of the drug on each component of the audiogenic seizure. Data gathered in this manner can also be manipulated to distinguish between drugs effective in generalized tonic-clonic, simple and complex partial seizures from those effective in absence seizures.4 When the ED50 for the minimally detectable anticonvulsant effect in GEPR-3s (vertical axis) is plotted against the ED50 in GEPR-9s (horizontal axis) for clinically effective antiepileptic drugs, two distinct clusters of drugs appear (Figure 6.5). The first includes drugs effective against generalized tonic-clonic and partial seizures. The second cluster includes drugs effective against absence seizures. 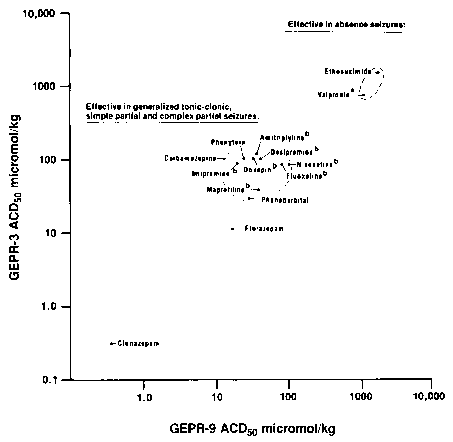 The second cluster occurs at doses from 1 to 2 orders of magnitude greater than the first cluster for both GEPR-3s and GEPR-9s. 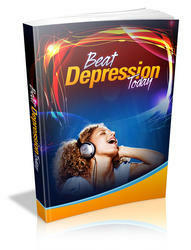 Also included in the first cluster are a number of tricyclic antidepressants. This model predicts that these antidepressants would be effective in generalized tonic-clonic or partial epilepsy. This remains to be determined. It is important to note that valproate, clinically effective in generalized tonic-clonic, partial, and absence seizures, is located between ethosuximide and the first cluster. Thus, this data manipulation may be capable of predicting broad spectrum clinical efficacy as well. Similar data manipulation could be performed between different mouse strains susceptible to audiogenic seizures. Focal seizure mechanisms (or seizure initiation mechanisms) and seizure propagation/generalization mechanisms appear to involve separate neurochemical and anatomical substrates in the GEPR. If one attempts to completely suppress audiogenic seizures in a GEPR-9 with phenytoin, the components of the audiogenic seizure are eliminated as a function of increasing dose in the following order: hindlimb extension, forelimb extension, generalized clonus, and finally the running episode.12 Wild running, the focal event in an audiogenic seizure, is more resistant to the anticonvulsant effects of phenytoin than are the seizure components related to seizure generalization in the GEPR. We are in the process of developing a method of anticonvulsant assessment in the GEPR that distinguishes between the relative antifocal and antigeneralization properties of a drug. 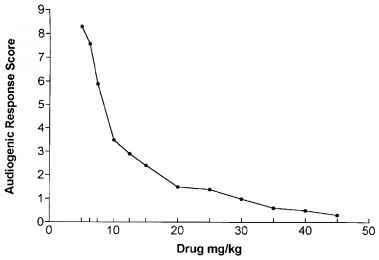 This model should allow such comparisons across different drugs. To accomplish this, quantal dose-response curves are determined for suppression of hindlimb extension, forelimb extension, generalized clonus, and wild running (complete seizure suppression) in GEPR-9s. Then mean ARS scores are plotted for each dose utilized in the generation of these four quantal dose-response curves, generating a graded dose-response curve (Figure 6.6). Finally, linear regression analysis is performed on the ARS scores and the doses falling within the linear portion (ED16 to ED84) of the hindlimb extension dose-response score (Figure 6.7). A similar regression analysis is performed at the linear portion of the wild running dose-response curve (Figure 6.7). Thus, two dosage intercepts are obtained, one for suppression of the focal event (wild running) and one for suppression of the generalization event (hindlimb extension). 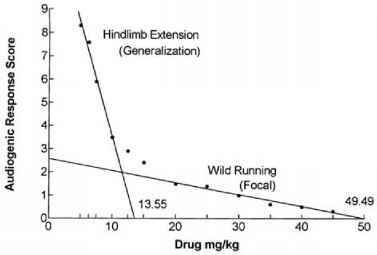 One can then determine the ratio of the wild running dosage intercept and hindlimb extension dosage intercept and obtain a focal/generalization ratio that can be compared across different drugs. The smaller the focal/generalization ratio is determined to be, the greater the antifocal properties of a drug would be. A graded anticonvulsant dose-response curve for complete suppression of audiogenic seizures in GEPR-9s for a hypothetical drug. Regression analysis of hindlimb extension and wild running components of the hypothetical graded dose-response curve depicted in Figure 6.6. In this model, hindlimb extension represents seizure generalization and wild running represents focal seizure activity. Linear regression was performed on ARS scores and the doses falling within the linear portion (ED16 to ED84) of the hindlimb extension dose-response curve, generating a generalization dosage intercept of 13.55 mg/kg. Linear regression was also performed on ARS scores and the doses falling within the linear portion (ED16 to ED84) of the wild running dose-response curve, generating a focal dosage intercept of 49.49 mg/kg. The focal/generalization ratio for this hypothetical antiepileptic drug is 3.65.
anticonvulsant response to be either complete audiogenic seizure suppression or no effect at all, as a function of dose. A similar method comparing generalized clonus to wild running dosage intercepts can be performed in the GEPR-3. Studies utilizing drugs clinically effective in generalized tonic-clonic and partial seizures are currently underway in both GEPR-9s and GEPR-3s in our laboratory. Preliminary results are promising, suggesting that phenobarbital possesses a lower focal/generalization ratio than phenytoin in GEPR-9s. There is no reason why this procedure could not be applied to mouse strains susceptible to audiogenic seizures. In fact, the population of partial seizure patients refractory to current antiepileptic drugs might actually consist of multiple populations, each optimally treated by a different, yet undiscovered drug. Such drugs might be discovered in specific mouse or rat strains. In conclusion, this rationale supports the need to screen potential anticonvulsant drugs in animals genetically predisposed to epilepsy in addition to traditional screening methods.